On the 6th of April, 2016, our team had the chance to meet with the Ambassador of Serbia, H.E Dusan Crnogorcevic. Here is the interview we conducted. 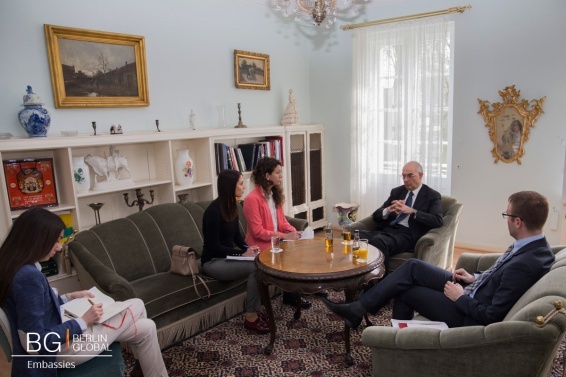 His Excellency asked our team to not record anything during the meeting, so we summed up what was said in the nice mansion housing the Embassy of the Republic of Serbia. His Excellency told us about his first post in Syria, a very challenging one when he was a young diplomat (between 1981 and 1985). When he was a diplomat in Syria, Lebanon got invaded. Being very close to Lebanon at that time, he went there and saw the country as well as the war. He insisted on the absence of any technology back then: there was no mobile phone at the time and he was on his own. He told our team remembering very well that he was the only one who could make the decisions and there was no one to help him out, he had to rely on himself and on his own judgment. He saw the militias fight against each other and the town he was in was sealed off just after his departure. His Excellency then reflected on how technology helps you out in this kind of situation. It made diplomacy change a lot. Indeed, today it is less formal, it has lost the prestige that it had before. In fact, important people like Prime Ministers meet regularly now and know each other well, and they have direct contact by mobile phones. The protocol is not strictly followed anymore. Serbia is a small country and in general small countries are talked about when something goes wrong. However, His Excellency thinks that Serbia has a lot to offer in different fields. Cultural diplomacy for Serbia is an ID card to the rest of the world. Through its sports, art, literature, it is very well represented on the international stage. For instance, we can think of the world's famous tennis player Novak Đoković, the writer Ivo Andrić, Nobel Prize winner, famous scientist Nikola Tesla and modern artist Marina Abramović. In addition, last year Serbia was talked about in the German media because of the refugee crisis. The Ambassador as well as the media stated that Serbia behaved in the best possible way, treating the migrants with humanity and respect. 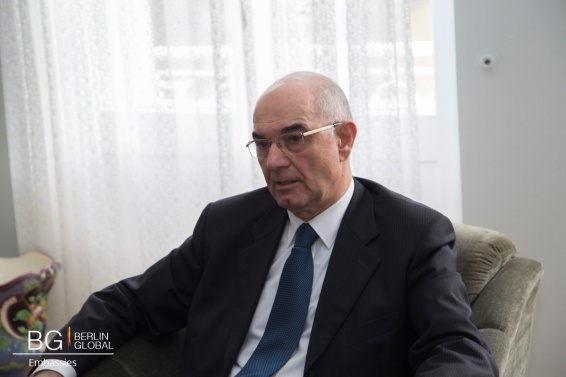 Even though the country received around 650 000 migrants, its Ambassador says that Serbia is satisfied with its job. In fact, Serbia managed to supervise the registration, medical help and the food supply well, even though it was not an easy task for such a small country. One way is through the European Union National Institutes for Cultures (EUNIC), where Serbia, along with Switzerland, has a permanent guest status. Through EUNIC, the Embassy has the opportunity to organise a range of activities, among which i.e. the presentation of the Serbian author Dragan Velikić at the Austrian Embassy. Another example is the Embassy's participation in the European Day of Languages: thanks to two lectures in schools, the Embassy was enabled to share the Serbian languages as well as its culture, customs, its history, its people and its land. The Ambassador said how pleased he was with sharing the culture of his country: This just confirms that smaller countries can also be very active in the cultural aspect of life. The relationships between Germany and Serbia are excellent, praised his Excellency, whether politically or economically. For instance, Chancellor Angela Merkel went to Serbia in July 2015 and then invited the Prime Minister of Serbia to visit Germany, which he did in September of 2015. Regarding economic relations, Germany is the second trade partner of Serbia, neck to neck with Italy. Germany is though the first by far concerning foreign investments. There are around 300 German companies in Serbia, employing around 30.000 employees. The Ambassador stressed that there is always room for improvement and Serbia expects many new foreign investments and companies. Indeed, the government works hard on showing to German investors all the advantages of choosing Serbia among the Balkan countries. „The closer to Europe, the better”, he stressed, because it makes the possibilities of investments grow. For Serbia, “there is no other way but Europe”, it is a “must”. “There are other options but Europe is the best”, “it’s our destiny” emphasized the Ambassador. In fact, Serbia has eight neighbors and all of them are part of the European Union or tend to become ones. Being part of the European Union would just make sense geographically for His Excellency. Besides, 63% of Serbia’s trade is with the European Union and 25% is made with its neighboring countries. However, the Ambassador is well aware that Serbia needs reforms of the State and the administration. They know very well that they have problems with corruption, organized crime and the sector of justice but to improve the situation, chapters 23 and 24 need to be opened soon. An entry in the European Union would enable Serbia to reform efficiently its society and state. Although some people seem to think that Serbia wants to get in the European Union to enjoy financial benefits from it, the Ambassador stresses that Serbia is only craving reforms. It is important to notice that Serbia has been improving steadily, and the country has for instance successfully cut the budget deficit which is now only 2,2%. Besides, if the rate of unemployment was very high a few years back (25% in 2012), it is today of 17% and the government is still working on lowering it to 10% at least. First of all, one who wishes to enter the closed circle of diplomacy should be involved in the field of foreign policy. His Excellency thinks “the world is boiling”, many things are happening all the time in the world and one should know as much as possible about it, they should know the job is in a “full gear”. Secondly, considering this is a job that enables you to travel in various countries worldwide, one should be open-minded towards meeting new people and cultures. Our team would like to address many thanks to the Ambassador Dusan Crnogorcevic and the Embassy of Serbia for receiving us and sharing his experience.